Cambridge Indoor Open, 26th/27th Feb 2011 | Birmingham Hardcourt Bike Polo, UK. I must be the fastest blogger in the West (Midlands). This http://www.lfgss.com/thread58349.html#post1911632 was only announced an hour ago! The format hasn’t been announced yet, but all of the crucial details are in place, including what is apparently a very sweet indoor court – more on that soon. As it’s an open tournament, anybody can go. You just need to form a team and pay your £15. 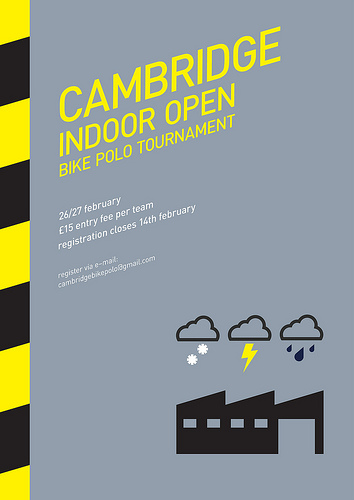 This entry was posted in Birmingham Bike Polo and tagged bicycle, bicycle polo, bike polo, birmingham bike polo team, Cambridge indoor open, Cambridge Open, Cambridge Polo Tournament, tournament. Bookmark the permalink.